As the population ages and time marches on, gen-X and older are facing the dual role of caring for their elderly parents while raising their own family. Members of these generations juggle being a child and parent, often while supporting adult children of their own. According to the Pew Research Center, just over 1 of every 8 Americans aged 40 to 60 is both raising a child and caring for a parent, in addition to between 7 to 10 million adults caring for their aging parents from a long distance. · Traditional: those sandwiched between aging parents who need care and/or help and their own children. Taking care of elderly parents while tending to your own family? 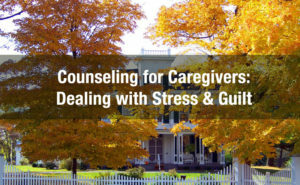 Caregiver stress and guilt is real, and counseling can help. · Open Faced: anyone else involved in elder care. In all of these scenarios, the caregiver has multiple layers of responsibility, including family responsibilities, providing emotional support and in some cases, financial support, both to their parents and grown children. It is estimated that American families provide 80 to 90 percent of all in-home long term care services for their aging family members, disabled adult children and other loved ones. These services may include assistance with day-to-day activities, coordination of doctors’ appointments, medications and assistance with financial, legal and emotional needs. It is impossible to put a price on these services, but they do take their toll. The caregiver may experience stress, burnout, depression, isolation, and a sense of being trapped or overwhelmed. While keeping lines of communication open, holding regular family meetings, sharing responsibility with partners and siblings and asking for assistance are all important; there are instances where professional counseling may be beneficial. Lake Orion Counseling Center has therapists who specialize in stress management, marital counseling, family therapy and parenting support. Please contact us today regarding your needs and those of your family. Our goal is to help you improve the quality of your life and those of your loved ones, both older and younger.